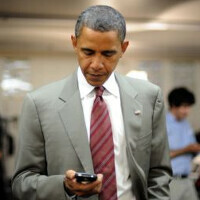 It is well-known that President Barack Obama is a BlackBerry addict. This addiction dates back prior to his first presidential campaign. There was talk about getting the monkey off his back, but the Commander-in-Chief says he cannot switch to an Apple iPhone for security reasons. Obama isn't totally without an iOS device as he was given an Apple iPad 2 by Steve Jobs himself. On ABC TV's Jimmy Kimmel Live Thursday evening, the president said that he never uses Twitter and rarely composes his own texts. Referring to BlackBerry's highly-regarded email client and physical QWERTY, President Obama said, "I don't text. I email. I still have a BlackBerry." While his daughters both own smartphones and send text messages, Obama said that he was barred from having a phone with the latest technology for security reasons. He isn't even allowed to own a phone that has a voice recorder installed. During his appearance on the show, the president was asked by Kimmel if he could share Hillary Clinton's new email address with him. "I can't share it with you. I don't think she'd want you to have it, frankly," the president joked. Clinton, the front-runner to be the Democratic Party's presidential candidate for 2016, was discovered using a personal email account while Secretary of State. That is a no-no in Washington D.C.
Kimmel also took some time to have the president read some of the "Mean Tweets" posted on Twitter about him. You can check it out by clicking on the video below. Jimmy Kimmel and Jimmy Fallon - two great comedians but Jay Leno can't be touched. The way I see it is... Jimmy Kimmel has the best celebrity contacts and invitees to the show. Jimmy Fallon has very good games but he is far from being funny. Conan is damn funny. Ellen - Not for men. Jimmy Fallon a great comedian? A knee to the crown jewels is funnier than that stooge. Fallon falls flat to both of 'em just sayin. That's a lie. He tweeted on the official white house page yesterday about the police being shot in Ferguson. The only downside to be a president of the United States is he must use a dinosaurs. I wonder what Putin use? Putin users YotaPhone of course, its Russian! LOL. and India PM, Narendra Modi, use Micromax?? and use TATA as the car? Lol, go on. Indonesia's president? Anytime a president has to go on a talk show, you know he only has a clueless audience. As he plays with his blackberry, people are getting shot, burned, and beheaded in the Middle East by the very people he created. What a guy. Sorry to spoil your troll session but it was Bush 41 who got that ball rolling. I don't know if you're playing the Black President angle or the dumbass Neo-Con angle but I'm here to give you the facts angle. While Bush 41 was still St. Reagan's VP, he brokered the Iran-Contra deal. When someone blew the whistle to Congress, them boys in the Middle East got some kind of pissed. Read your history if you're not old enough to remember - and I don't mean Wikipedia. Love the Prez, funny vid too. What effing idiot took on taxpayer funded 747 to a west coast democrat fund raiser while his effing wife took another taxpayer funded large jet to the same place just to dance. ALL ON THE SAME DAY. Meanwhile people are getting murdered in the Middle East by the people the effing idiot created. Up until St. Reagan and Pothead Nancy, every President kicked it in a B707. I guess it wasn't good enough for Ronny and he ordered up the B747 and switched from a Lincoln limo from the Nixon era to a ballin' Cadillac. If you're going into a battle of wits, don't come unarmed.